Buttercream and I have a love-hate relationship, in that I love that it doesn’t taste like fondant (yuck), but I hate that sometimes it’s too sweet and clumps up in my decorating tips. But now that I’ve figured out just how easy Swiss Meringue Buttercream (SMB) can be, I’m never going back to that sugar-heavy concoction of artery clogging mess. I received an order for a wedding cake that needs to be done and delivered in the coming weeks. 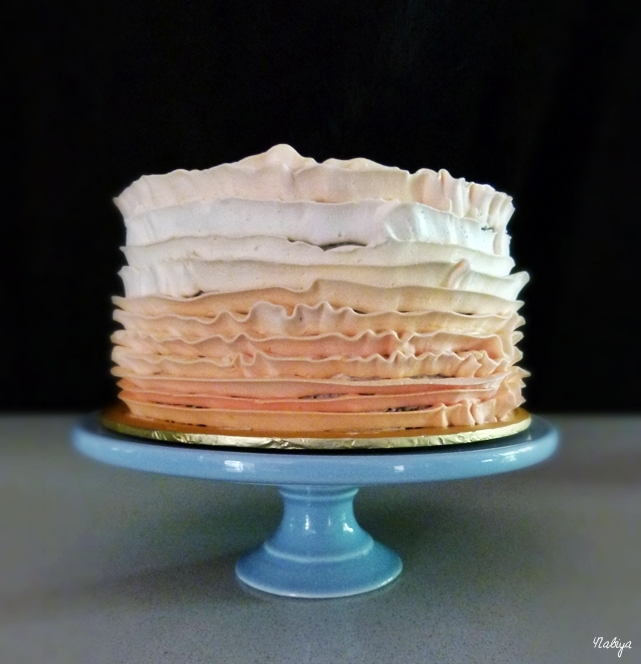 The bride wants a ruffle cake, but using buttercream instead of fondant, and she wants it in shades of pink, and though she didn’t specify this… I had better damn well make sure that it’s tasty! So taking into consideration the humidity of the local climate, I need to pressure test my SMB! First of, 2 weeks before the order date, I’m working on perfecting my decorating. Buttercream ruffles are easy enough when you have the right frosting consistency, and the right tools, but my shaky hands definitely need some practice before I go on to the big leagues. And sure enough, this practice cake I did for my friend’s birthday came out a bit off the mark of what I’m aiming for with the wedding cake. I’ve made a list of things to improve, such as gaps, angles, closures and joints *facepalm* basically everything. It’s still pretty though, so I thought it’s worth sharing. I used the SMB recipe posted below, and this chocolate cake recipe. I filled it with seedless raspberry preserve to counter the chocolate and buttercream, and used a Wilton #104 tip to create the ruffles. Tip: sit down and get on eye level with that sucker, cos it’s gonna be a pain to get the angle right when you’re standing over it. Also, get a rovolving cake decorating stand (I got mine for so cheap! Woohoo!) cos it’s a lifesaver.